Monday Motivation. Triathlon training updates. 2 weeks to go until the Lobsterman Olympic Distance Triathlon. This will be my 3rd triathlon. I am excited to race because the Olympic Distance will be short compared to the Half Ironman. I am also excited because my roommate from senior year in college will be racing too so it will be great to catch up! Not only is the Lobsterman a great race but all finishers (who sign up ahead of time) are treated to an amazing Lobster dinner post race. Last year this lobster was perhaps the best thing that I had ever tasted . . . the taste of victory! I had finished my first triathlon. The Lobsterman Triathlon is also a fun race because it takes place on the coast of Maine right near Freeport which means there may be some outlet shopping during the weekend. Last year we stayed at a great bed an breakfast right in Freeport which isn’t too far from the race start. After the race we headed to Portland Maine for some R & R and delicious food. We spent some time wandering around the Old Port checking out the cute little boutiques. And a delicious cupcake shop. 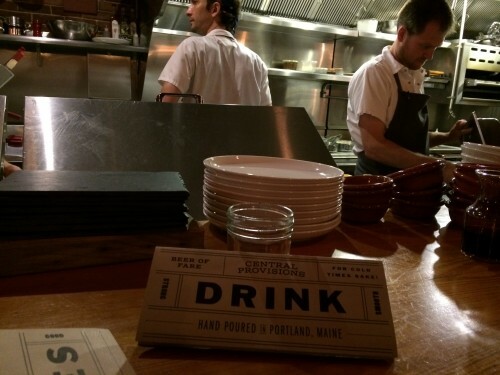 Then we had dinner at Central Provisions, an incredible Tapas style restaurant. This was definitely the perfect way to wrap up the weekend and to refuel after an awesome first triathlon. I am already thinking that we may have to revisit the same pre and post race plan as last year including our dining choices. 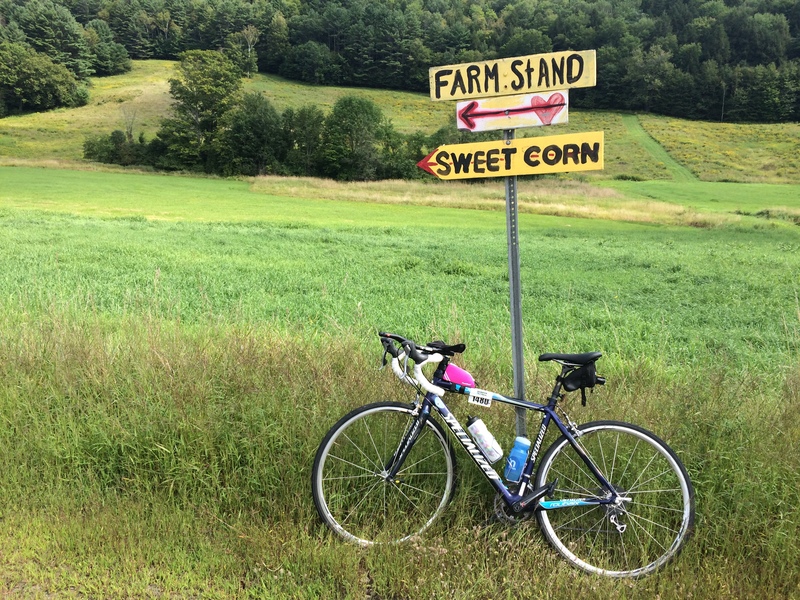 Ok, so you can tell I am getting excited for a fun race weekend in Maine but you are probably wondering how my training/recovery has been going since the Timberman Half Ironman. Last weekend I was convinced to run a 20 miler with my friend Bridget which probably wasn’t my best decision. While I felt pretty good on the run I started off the week feeling sluggish and tired. I took Monday and Tuesday off because I was tired and also because my kids and I were trying to squeeze in the last few moments before school started on Wednesday. On Wednesday the kids headed off to the first day of school with my youngest starting kindergarten and my oldest heading into second grade. While I can’t believe my youngest is now in Kindergarten I am excited to have them both at the same school because the cuts down my drive time hugely. It is also great to get back into a regular routine. Friday: 3o minute easy trail run. I was feeling run down so I skipped hill intervals and shortened the run. Sunday: Rest Day. I skipped today’s work out because I am having an issue with my back again. My lower back has been in spasms all day. This seems to be a similar issue to last fall due to tighness in my piroformis and glute med. Hopefully this does not become a chronic issue again. I am going to take it easy for the next couple of days in hopes that this back problem resolves. My fingers are crossed! What was your training like last week? Are you struggling with any current injuries? What races are you looking forward to this fall? 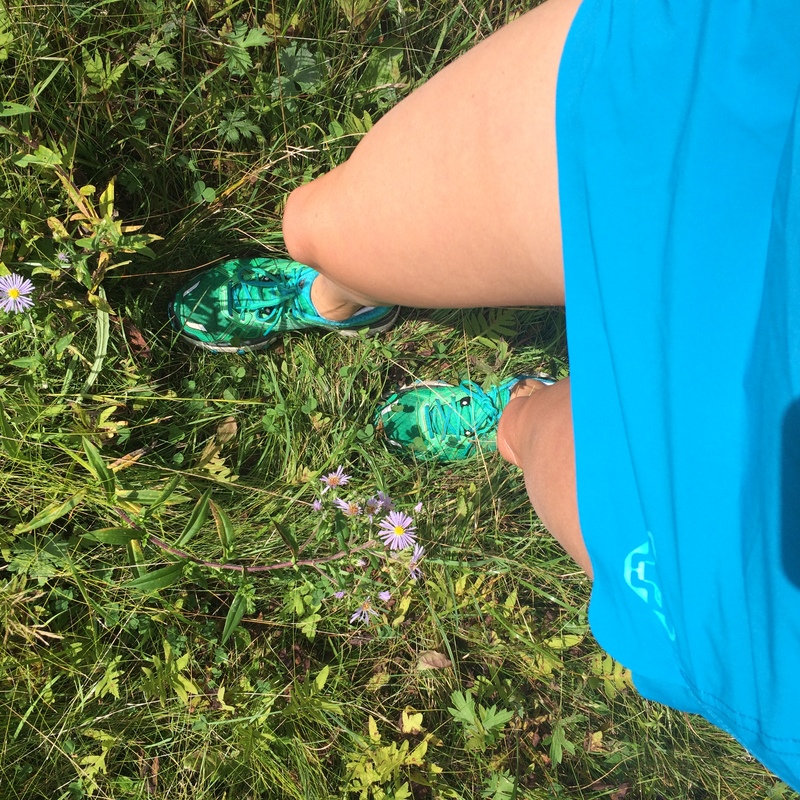 Don’t miss my current review of Dynafit running gear and my giveaway for a Dynafit React Jacket which will be perfect for all of your running adventures. My kiddos are headed for their first day of Kindergarten on Wednesday. Eeeekkkk! All of the emotions are going to come flooding out! I just had a friend tell me about this race…maybe next year! I hope you can rehab your back and get your body in check before the race. Good luck!!! How cute do they look w those big backpacks? I miss those days. Looks like training is right on track good luck! I hope your back gets better! Maybe if you wear one of your kids’ awesome backpacks it’ll heal up haha. I’m looking forward to running my second marathon this fall! eek! Hey Sandra, I noticed you wear smashfest tri gear. I’m curious about the sizing? Does it run small? How is the built in bra? Thanks! I’d probably very easily be convinced to do a tri if it involved a lobster dinner after the fact. ha! Boo to the low back pain! Does it go away if you stretch/foam roll your glutes and hamstrings? Ugh. That back to school picture is so cute! Love it! My kids got back to school last week and though I miss summer, i too needed to get back to some semblance of a routine. Timberman is a tough race, and to have that be your second tri ever? wow! We always enjoy tapas style dining. I can’t believe it’s so close to race time. Your training seems to have gone by so fast. ugh, hope your back gets better quickly! I spent some time in Maine earlier this month and it was glorious!!!! I want to go back! I would sign up for this tri based on the lobster dinner alone! The week was ok. I suffer from PF, but it is what it is. This was a heavy training week for me. I’m pretty worn down and I still have one long run to go. Looking forward to a lighter week next week. I would totally run a race for a lobster at the end, one of my favorite foods…but only if it’s Maine Lobstah! Training is going well here, and thank goodness I am staying injury free this time (knock on wood)! 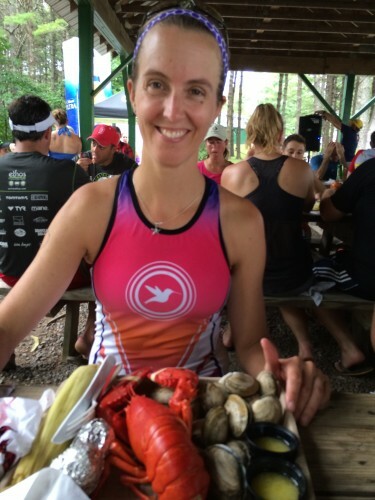 An Oly tri with lobster post-race sounds perfect! I still feel like I need more work swimming before I even think about anything beyond a sprint. Back to school = bittersweet. My kids are starting week 3 already. Great post! I’m training for the Richmond Marathon in mid November and I’m doing ok, but I missed my long run this past weekend. But i know life happens so I’m doing my best to get back on track! Best of luck with your race! I hope your back feels better! I have had any running injuries lately (knock on wood), but I woke up yesterday with sever neck pain that killed my long run. Thankfully today it pretty much resolved. I’ve heard great things about Lobsterman! I don’t have any injuries right now (knock on wood) but am just getting back into shape after having a baby a few months ago, so it’s been a challenge! I had lobster in Maine at my friend’s wedding years ago. It was the BEST lobster I have ever had. What an amazing post race meal!! 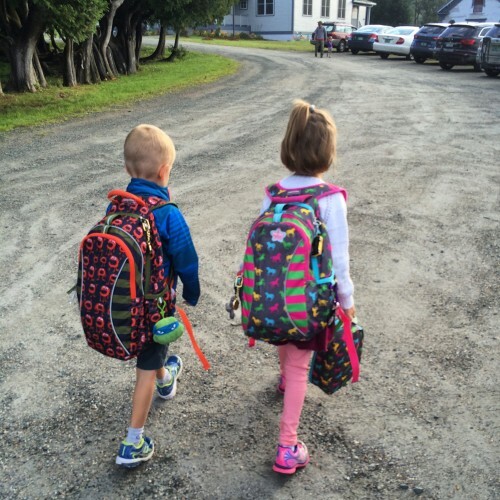 Your kids and the backpacks are so cute. And you live in a beautiful place. Thanks for sharing. I am all about racing for some post-food, both lobster and cupcakes sound wonderful! Good luck! Great training updates… I am sorry your back is hurting you though. No bueno. lobster post triathlon sounds amazing! hoping you have a great race and no back pain! Hope your back feels better! 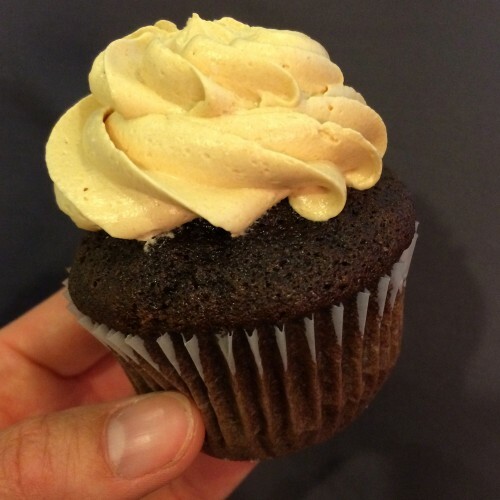 That post race cupcake looks yum!